‘Can You Ever Forgive Me?’ starring Melissa McCarthy is showing Nov. 2-8 at the SIFF Cinema Egyptian. Find tickets at siff.net. For the first part of “Can You Ever Forgive Me?” it’s unclear just how far Lee Israel’s life has fallen. 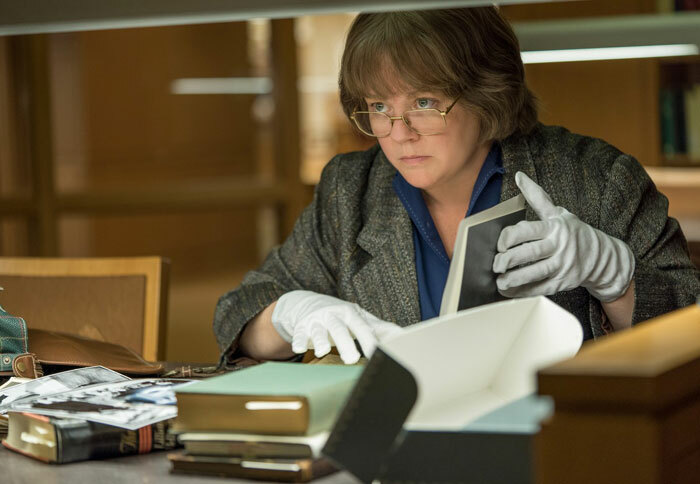 We know that she made her living in the 1960s, ‘70s and ‘80s writing profiles of high-achieving women, and we know that the current stonewalling by her editor, and the general muted tone of the world that director Marielle Heller imbues the biopic with suggests that things are rough. But between her generally acerbic personality and her even sharper tongue, you wouldn’t necessarily know it. And she’s right, in a way; the movie isn’t shy about connecting the lines between the two, whether by their drinking or by their bite. Even the title of the film is pulled from one of Israel-as-Parker’s letters, explaining away a drunk night on the town. It’s a tendril that doesn’t quite go anywhere, but provides the volume behind the shame that Israel feels about the whole enterprise, and indeed her whole worldview. It’s there when she pushes away the flirty friendship of one of the shopkeepers whom she sells her letters to, and it’s there when she’s quick to immediately cut ties with those who have wronged her. The dreary world of 1991 New York feels almost like it’s filtered entirely through Israel’s cloud of myopic misery. This movie is a bit of a square peg being forced through a round hole: Despite Heller’s focused approach to the biopic, the film still feels a bit more typical than a story like this should. Thankfully missing are any long montages or monologues explaining how this side of the world works, or just how high the stakes are. But there’s still a sense that this brief but bright chapter in Israel’s life is being weighed down to something more mainstream than the author deserves. The scenes between Israel and Richard E. Grant’s Jack Hock, an aging ne’er-do-well who has fallen on even harder times than Israel has are when the film really sings. McCarthy’s brand of caustic humor lends itself well to Lee Israel’s world of pushing people away, and it’s always going to be fun to watch her dig into people. But there’s also a different side to her, often seen as the “before” side of her character in films. “Can You Every Forgive Me?” dares to put that character at the end, having learned to let people in, if not love them. And as good as she is, never has her performance been quite so generous. When McCarthy shares the screen with Grant, she draws herself in, allowing him to take up the air in the room (as a charismatic and flamboyant grifter like himself should). By the end of the film it’s clear how far Israel had let herself fall, how deeply she needed others to be wrong, so she could be wronged. All it takes is a bit of fraud and a sleepy thriller to wake her up to what her life was all along: her own design. And while it’s a bit more pedestrian than a character like Israel has any right to be, the’s a vibe that’s certainly no fraud.